Beginning in 1970, a diverse array of Nashville musicians who had in common an abiding love of big band music came together to form an ensemble devoted to capturing the rhythmic sounds of the Forties and Fifties. Today, this well-rehearsed and highly skilled 20-piece band is in demand throughout the Mid-South. Professional in every sense of the word, the band is made up of doctors, lawyers, academicians, corporate executives, and entrepreneurs, as well as professional musicians. The Establishment regularly packs hotels and clubs with audiences that love danceable, soft-muted brass. Wherever they play, from society balls to music-hall concerts, their big band sound draws applause and cheers and shouts of praise. 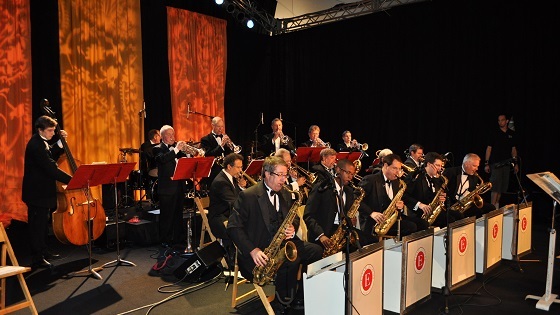 With an extensive repertoire of the great music made famous by the bands of Glenn Miller, Tommy Dorsey, Count Basie, Harry James and others, The Establishment was for eight years the band in demand at the Opryland Hotel's big New Years Eve Gala, and was featured on the Big Band Cruise of the showboat General Jackson. Four rhythm players, five reeds and ten brass comprise the band which was founded by Del Sawyer, Dean Emeritus of Vanderbilt's Blair School of Music. In April 1998, Del handed over the baton to Billy Adair who was an incredible arranger, arranging many of the vocal charts currently in use by The Establishment. Vocals are handled by the talented Sarah Edmonds and Eric Stein with arrangements skillfully crafted by Mr. Adair. After the unexpected passing of Billy Adair on February 18, 2014, the baton was passed to the current director, Cole Burgess on July 1, 2014. A non-profit organization, The Establishment generates scholarships for musically talented children to receive individualized instruction at Blair School of Music and at the W.O. Smith Nashville Community Music School. Though the band works only for the love of music and the support of a new generation of musicians, it is in no sense an amateur group. Each new member is carefully auditioned and shares the band's commitment to rigorous weekly rehearsals. Devotion and skill are the trademark of The Establishment, a musical organization that represents professionalism at its best.